Filice, Michelle. "Crown-Indigenous Relations Canada". The Canadian Encyclopedia, 16 January 2019, Historica Canada. https://www.thecanadianencyclopedia.ca/en/article/crown-indigenous-relations-canada. Accessed 24 April 2019. Crown-Indigenous Relations Canada (part of the former Indigenous and Northern Affairs Canada or INAC) was created by the federal government in 2017 to oversee matters pertaining to Indigenous-government affairs, such as treaties and Indigenous rights. The department is tasked with accelerating progress towards self-government and working in cooperation with Indigenous peoples to achieve desired ends. Until July 2018, this new department also managed the Northern affairs portfolio, which concerns the needs of communities living in Northern Canada. Northern affairs is now part of another new department: Intergovernmental and Northern Affairs and Internal Trade Canada. 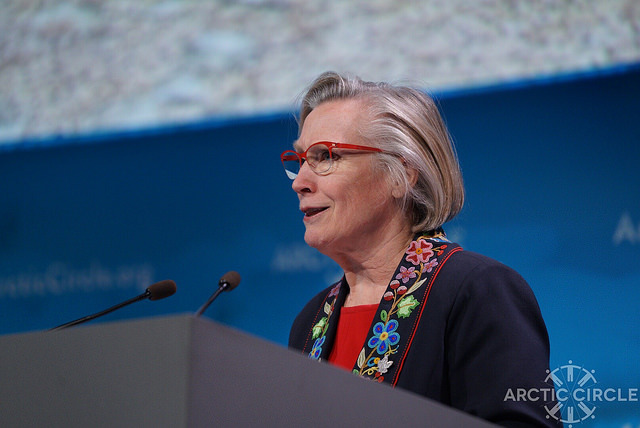 Carolyn Bennett, Minister of Crown-Indigenous Relations Canada, at the Arctic Circle assembly in 2017. Indigenous Services works toward improving the quality of services delivered to Indigenous peoples, with the eventual goal of having these services delivered by Indigenous communities rather than the Crown. Crown-Indigenous Relations and Northern Affairs Canada (which became Crown-Indigenous Relations Canada in July 2018) oversees Indigenous-government relations, including matters pertaining to treaty rights and self-government. Northern	affairs is now part the Department of Intergovernmental and Northern Affairs and Internal Trade Canada. Carolyn Bennett, the first minister of Crown-Indigenous Relations, described INAC as “outdated and paternalistic... designed to enforce the Indian Act.” The new departments, on the other hand, are “distinctions-based and rooted in the recognition of rights, respect, co-operation and partnership.” The federal government	described the restructuring of this department as a “next step” to abolishing the Indian Act. 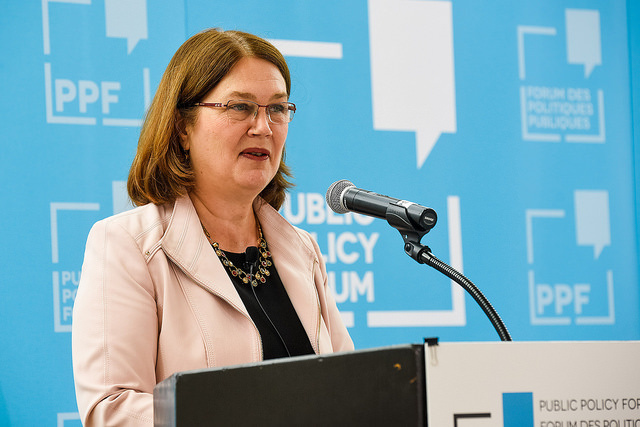 The department has outlined priority areas for its 2018–19 agenda, including improving relationships with Indigenous peoples and encouraging self-government. The goal of supporting self-determination is meant to provide Indigenous peoples with the power to control their own communities. The department aims to increase the progress of both comprehensive modern treaties	and new self-government agreements. MANDATE LETTER Read the mandate letter written by Prime Minister Justin Trudeau to the first ever minister of this department, Carolyn Bennett. DEPARTMENTAL PLAN Read more about the 2018–19 departmental plans of Crown-Indigenous Relations Canada.